A gift from commenter G. Hodder, this fine – very fine – Imperial Stout has a sweet, musky/molasses richness edged with good bitterness of lightly herbal and quinine qualities. 10.5% ABV. One can see the name of the beer is a take-off from that impressive strength. Poured at room temperature as any impy stout should be, its merits sing out with clarion certainty: all other considerations including the ambient 90F temperature recede into insignificance. 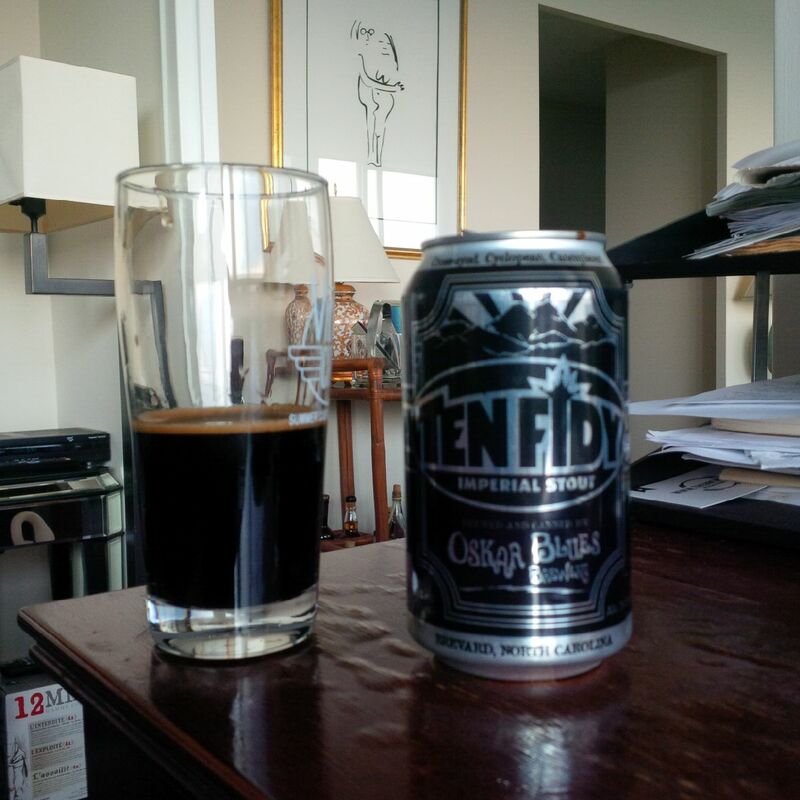 Now, I recall Tenfidy being brewed in Colorado where Oskar Blues started. This can states the beer is made by Oskar Blues in Brevard, North Carolina. I could check, but it must be a satellite operation. The brew is first-class all the way, so the second location of brewing either helped or did no harm. Imperial stout is the greatest beer style yet devised. There, I’ve said it. I’ve had all the styles, and it amazes me this style is known, at best, to a few ten of thousand in North America and elsewhere. It should stand with vintage port, well-aged single malt and Cognac, Sauterne, and the classified and other highly reputed growths as the most aristocratic of drinks. It would benefit from such imprimatur, but it doesn’t need it for validation at that level. Enough distinctive voices, starting with the late beer critic Michael Jackson (albeit the style was noticed before his definitive accounts), have raised their voice to put this beyond question. Strong porter of this type, top of the metaphorical coal heap, had its origins in the popular public houses of early 1700’s London. Porter seems to have emerged as a kind of accident, possibly a use of cheap (burnt) malt charged at a discount, later blended with other beers which brewers then emulated in a single brew. Whatever the explanation, the strongest and most malt-laden of the porter and stout family ended as princely drinks. The best porter should be aged a year or two but I think this Tenfidy is at the top of the aforesaid coal heap: one year gives it just the right tone and depth without sending the drink into an (irrecoverable) tailspin of autolysis or oxidation. If you taste a strong soy-like effect in your stout, that’s likely autolysis at work; the yeast starts to feed on itself. Of course some people like that, and more power to them, but the Tenfidy as currently tasted won’t benefit by much longer in the can, IMO. That’s one of my all time favourites, I was ecstatic to see it come to BC last year! Oskar Blues was one of the early craft brewers to use cans… They canned Dale’s Pale Ale in 2002. I don’t know that I’ve ever seen Imperial Stout in a can……. Is this a current common practice? Yes cans are being seen increasingly now for almost any style of beer. Wellington Imperial Stout (Guelph, ON) has been available in cans for many years. I agree the imperial stout deserves better recognition. I plan to test your comments about age, for I have squirrled away a number of the Tenfidy for future testing. I must say I like it just a little cooler than room temperature. It is such a big drink that there is no problem with small sips to let it warm up to where it ought to be. Please report well and truly on your experience with different aging!